I enjoy dancing (ballet, jazz, and tap) and have performed in Delaware Dance Company’s The Nutcracker since age 7. I am excited to be a Page and a member of the Trepak Corps in this year’s production. 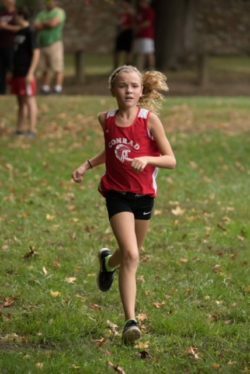 I also enjoy running – this is my second season running cross country on the middle school team at Conrad and I ran track last year where I competed in the 800m run, 1600m run, and on my team’s 4X400m relay. I am most motivated by my family and my friends. Exercise keeps me busy and healthy and I enjoy competing, both against myself and others. I’m not sure yet what I want to be when I grow up. One of my role models is my cousin, Keira Smith, a high school runner in Ohio.